Not long ago in Washington at the Institute of National Strategic Studies of the National Defence University the round table on “The Multimodal Threats in the Kurdish Region” took place, a continuation of the “NATO and Regional Military and Political Alliance in 2018” Council. The organisers of the meeting, taking place on April 9 to 11, were the Institute of National Strategic Studies, the Defense Threat Reduction Agency (DTRA), the intelligence community and the commanders of the Special Forces of the US. The main agenda of the event was focused on clarifying the conceptual and analytical foundations of American policy in the framework of topical issues of the “Kurdish question”, the problem of improving the coordination of regional allies, as well as military and political modeling of crisis systems that fall under the topology of “fallen state”. “Today, the USA, as never before, is faced with the destructive position of the Syrian regime and its allies, the Russian Federation and Iran. We met qualitatively new challenges and hybrid threats to freedom and democracy in Syria (SAR)”, with these words the special representative of the Department of Military and Political Modeling began his presentation, specialist in the field of pre-emptive analysis and the Greater Middle East of the Agency for the reduction of military threats Ray Ross. During the discussion, experts highlighted the most complex structure of the problems that cause the revision of operational resources, and as a consequence, reducing operational sustainability and “window of response” to the crisis situations. First, such challenges include the issue of harmonisation of positions and approaches. As an empirical base, analysts cite examples of the destructive positions of the Turkish Republic regarding the “united Kurdish space”, the inconsistent/punctual nature of the work of the UK, France and Germany in providing and preparing the Kurdish militia after the October operations in Iraq’s Kirkuk. During the meeting, the coalition failed to ensure prompt withdrawal of 140 Bundeswehr instructors and 30 specialist of the Special Aviation Service of the British Armed Forces. Second, comes the imbalance of the asymmetric military and political education within the framework of the international coalition. The fragmentation of Kurdish troops and militia (YPG) during the events related to the referendum on the independence of Iraqi Kurdistan and the subsequent military and political crisis, the split of the Peshmerga and other Kurdish armed groups controlled by Erbil; the growth in popularity of the Movement for Change or “Goran”, are a ready counter-rally against ex-President Massod Barzani’s block, the “Democratic Party of Kurdistan” and the “Patriotic Union of Kurdistan”. As a result, there is a curtailment of the potential of “Kurdish National Councils” in the Syrian Kurdish Supreme Council, in other words, the growing influence of the Democratic Union Party of Salih Muslim, supporter of the autonomy within the SAR, and the national Councils of Western Kurdistan, which may cause a potential strengthening of Moscow’s and Iran’s positions in the region. The disagreements between the Kurdish and Arab (Sunni, 23 movements) ethnic and religious components are, in particular the revolt of the Arabs in Syria’s Raqqa, armed conflicts within “independent” groups in North-Eastern Syria, caused by both “humanitarian” and military-political aspects, systemic shortcomings of the previous presidential administration to unite the projects of the “Kurdish Zone”, “Syrian Democratic Forces” and the “Free Syrian Army”. The data formed the need for duplication of “territorial formations” by independent structures, the creation of Kurdish security forces that are not included in the YPG during the last year. Along with this, it allowed partial substitution and assumption of the contingents of the Arab countries in the area of responsibility of the Alliance. Preliminary rounds of talks with Egypt, Saudi Arabia and the United Arab Emirates are now been held. “The newly formed security forces, along with the implementation of substitution approaches are certainly a guarantee for stability and security in the North-East of Syria”, stated Ray Ross. Third, the current problems required operational support for the concept “Balance of deterrence and engagement”, as described in previous submissions. Revision of the allies system, accompanied by a “balance of deterrence and engagement”. Thus, the methods to achieve a “balance of deterrence and engagement” through the support and expansion of special measures aimed at the integration of non-system actors of the military and political process are of greatest interest. “We conduct constant monitoring of the military-political process and its dynamics. It has already been six months that we monitor the escalation of the conflict in the north of Syria, which we repeatedly inform our allies, Turkey and other countries. Today within the framework of the modeling, we understand the need to involve all parties in the settlement process. Potentially, it may include the Kurdish Workers’ Party and the Democratic Union”, said the representative of DTRA. According to data received from the source “occupying a high position” in the Kurdistan Workers’ Party (PKK) since November 2017, personnel changes have begun, accompanied by an intra-party conflict. With the beginning of the Turkish operation “Olive Branch” the group “Will to Freedom” stood out, actively cooperating with the YPG troops, coordinated with the United States and its allies. The unit, numbering up to 5000 personnel, advocates for the change of the party’s leadership course and the formation of the “common Kurdish space”. “However, we must work to ensure that this organisation does not engage in destructive activities on Turkish territories”. In addition, in the ranks of the PKK, according to intelligence, in December last year a “right-oriented core” was formed, which began the extradition of previously left in Afrin intra-party opponents of the “new forces” with Salih Muslim. “The United States have actively watched this process, today we have a unique opportunity to unite these PKK platforms into a new, powerful force that can affect the entire region. These processes are very complex, but positive for national security”, commented Ray Ross. During the talks held at the end of December 2017, between the “new forces” and the Democratic Union Party, the parties could not agree on “extradition”, but agreements were reached in exchange for the deployment of seven training camps in North Africa in exchange for full support from the “right forces” in the PKK. The personnel trained at these facilities were intended for deployment on the neighbouring Turkish territory. However the Turkish side took these processes as a strengthening, an attempt to unite the Kurdish Workers’ Party and on January 20 launched the army operation “Olive Branch”, which ended with the capture of the city of Afrin and the division of the canton into Turkish and Syrian-Russian areas of responsibility. During the Turkish operation, with the support of the US, talks were held between the YPG and the Afrin security forces on the limited material and technical support, as well as sending a number of volunteer units subordinate to the military council of Manbij. Also, the “special contact mission” guaranteed full support in the case of coordination of the Afrin security forces, the dissolution of the HPX battalion and the “Desert Scorpion” brigade. De facto, this process should be seen as providing an alternative resource base, aimed at the involvement of the security forces and councils of Afrin in the structure of the YPG and the expansion of cooperation with the International coalition, i.e. the removal of Iran and Russia from the northern province of Aleppo. However, cooperation between Moscow, Tehran and Ankara did not allow the formalisation of this union. At the same time, analysts noted that the division, the failure of “involvement”, allowed to restore the balance of forces in the “Kurdish zone”, since after the military and political crisis caused by the “collapse” of Iraqi Kurdistan and the departure of Masoud Barzani as President, the “Democratic Union Party” significantly strengthened its position, “threatening the integrity of the Syrian Kurdistan”. However, after the division of Afrin, its potential, through natural processes, decreased, opening up new opportunities for the American side and the security forces that were created. Thus, turning to the conclusions, we can say that the American side is now involved in the processes of operationalization of the concept of “containment and engagement”, considering factor projects of unification of multidirectional forces through the chaos of existing crisis systems and territorial associations. The growing military presence in the area of Al-Tanf, and the disparate information of the transfer of Arab-Kurdish troops to the area, could potentially mean the unification of the YPG, the security forces and the new Syrian Army into a single structure. With the completion of operation “Olive Branch”, an extensive media company was launched to discredit the positions of Moscow, Tehran and Damascus in resolving the “Kurdish issue”. In mid-March 2018 in north-eastern Syria, a “Syrian popular Resistance” was formed, advocating the liberation from occupation by a coalition led by the United States. On April 15, 2018, the Department of Military and Political Modeling of the US agency for reducing military threats adopted the programme of development of the north-east of Syria, labelling this territory as “fallen state”. As disgraced American soldiers withdrew from Iraq in 2011, US Secretary of Defense at the time, Leon Panetta, hinted that Washington’s battlefield disaster did not spell the end of US interference in that country. For many, the US defeat in Iraq marked the end of the golden age of American combat. However, politicians like Panetta and those who came after him insisted on treating their losses in the Middle East as a temporary setback on the road to ultimate triumph. Just a few years after the 2011 withdrawal, American troops were sneaking back into Iraq under the cover of the black banner of Daesh. The chaos crafted by the terrorist franchise – paid for by the Americans and their allies – first gave rise to the so-called Islamic State, and later aspiring Kurdish statelets. Both had the same objective: to restructure the region, starting with the division of Iraq and Syria. But this month’s blitz campaign by Iraqi forces against Kurdish fighters and an offensive to route Daesh out from its final stronghold in the country translates into more of the same for Washington – military frustration and defeat. The degree of frustration was best summed up by US Secretary of State Rex Tillerson, who recently called on Iranian-backed groups in Iraq “to go home”. Tens of thousands of Iraqis heeded a call to arms in 2014, forming the Popular Mobilization Units (PMU) after Daesh seized a third of the country’s territory. Tehran’s invaluable contribution to the fight against the terror group is perhaps most evident in Iraq, where the Iranians funded and trained the PMU, which was integrated into the Iraqi security apparatus. Tillerson’s suggestion that these fighters should now “go home” was met with condemnation and mockery. “I don’t know how we can remove 65% of the Iraqi population and tell them to go home,” a member of Iraq’s State of Law Coalition, Saad al-Muttalibi said in reference to the country’s Shiite majority, which makes up the bulk of the PMU. Of course, it is highly improbable that Rex Tillerson did not know this. The unrealistic request from the top US diplomat was a way of telling the Iranian-allied PMU, which is at the forefront of safeguarding Iraq’s territorial integrity, to make way for the real “foreign fighters” in Iraq – the tens of thousands of U.S. troops. The opportunistic Kurdistan Regional Government in Erbil increased its territory by at least 40% between 2014 and 2017. Kurdish Peshmerga fighters occupied a number of disputed areas, including the oil-rich Kirkuk region, after the Iraqi army withdrew in the face of advancing militants. Last month’s Kurdish independence referendum claimed all of the newly conquered territory. The hope in Washington and Tel Aviv was that the Kurds could serve as the new force for destabilizing the region, and a base of operations for the project aimed at undermining the Iranian-led resistance axis. However, one month on, and the entire scheme appears to be doomed. Iraqi Prime Minister Haidar al-Abadi adopted an unusually hawkish stance following the referendum. 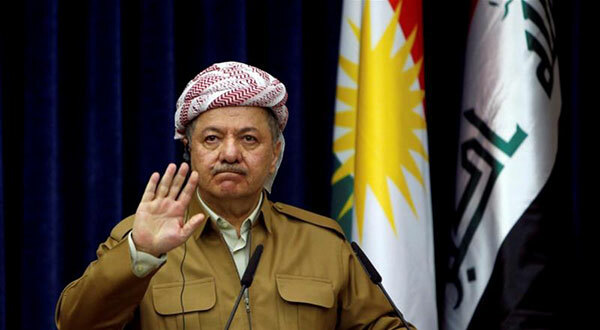 He gave the Kurdish leader, Massoud Barzani, an ultimatum, and then delivered on his threat by taking back Iraqi territory while using the country’s armed forces. The PMU was at the forefront of that effort. Qassem Soleimani’s presence on the ground was also instrumental. The commander of Iran’s Quds Force is widely believed to have made arrangements with local political and Peshmerga leaders, dissuading them from fighting. As a testament to just how desperate things have become in Erbil, the KRG’s has offered to suspend its drive for independence in return for a promise from Baghdad to halt its military activity. And in a display of just how confident Abadi has become, the Iraqi premier rejected the offer, demanding an annulment of the referendum results. Meanwhile, Iran’s role as a guarantor of stability in Iraq has been sealed. The developments on the ground have only served to bring Baghdad and Tehran closer together, leaving Washington out in the cold yet again. As such, the real winners of the Kurdish independence referendum are Abadi – whose handling of the crisis has likely secured him a second term in office – and certainly Iran, which further increased its influence in Iraq by quashing Washington’s grand designs for the region. Iraq is a country that can often be described as a place that produced too much history. It is the sight of seismic events that have a ripple effect on the entire region and beyond. Over the last couple of years, these colossal developments have frequently given way to existential challenges for the country. Despite the recent successes, Iraq is still at a crossroads. The threat of full-scale war between Baghdad and the Kurds remains a very real prospect. And while Tillerson’s call for the PMU to “go home” may be a sign of growing desperation, it also suggests that the tussle for Iraq is still very much an ongoing affair. – عندما هدّد داعش كركوك وصار على أبوابها هبّت واشنطن لتعلنها خطاً أحمر، وتركت البشمركة تتموضع فيها وفي حقول نفطها، وكما سعت قبل أيام لنقل الوحدات الكردية إلى حقول نفط دير الزور وترك الرقة لتنظيم داعش، منعاً لاقتراب الجيش السوري، عادت فنقلت وحدات داعش إلى هناك للهدف نفسه، وها هي ترفع الصوت عالياً لقيام الجيش العراقي بدخول كركوك وحقول نفطها. – عندما أعلن مسعود البرزاني الاستعجال بالاستفتاء على انفصال كردستان، كان واضحاً أن الأمر لا صلة له بسبب يتعلق بحق تقرير المصير الذي انتظر شهوراً لنهاية داعش وانعقاد حوار عراقي شامل لرسم خريطة المستقبل، وقد انتظر عشرات السنين. فالاستعجال هو لاستباق نهاية داعش وفرض أمر واقع يتصل بالاحتفاظ بكركوك التي تمّت السيطرة الكردية عليها تحت غطاء إبعاد داعش عنها. كما كان واضحاً أن نتيجة الاستفتاء الكردي ستكون سلبية إذا كانت كردستان من دون كركوك. كما كان واضحاً أكثر أن الاستفتاء الذي قد تخضع شرعية إجرائه في المحافظات الكردية الثلاث لكثير من الاجتهادات والنقاشات، إلا أن إجراءه من طرف واحد في كركوك هو غير شرعي وباطل، ومشروط بتوافق وإشراف الحكومة المركزية في بغداد، طالما كركوك مصنفة كمحافظة متنازع عليها، وبالتالي يصير واضحاً أنه بقدر ما النيات المبطنة للاستفتاء تقوم على السطو على كركوك، فإظهار حسن النية يبدأ بإعادة كركوك للسيادة العراقية وإلغاء نتائج الاستفتاء فيها، والرفض في هذه الحال يعني قرار حرب. – جاءت مواقف العراق وسورية وتركيا وإيران تقول لقادة إقليم كردستان إنها تأخذ شعبها للانتحار بالعناد الذي تبديه بالسطو على كركوك. وكانت قيادات كردية عاقلة ومعتدلة لا يُستهان بوزنها، وعلى رأسها الاتحاد الوطني الكردستاني، حزب الرئيس الراحل جلال الطالباني، تدعو لاستثناء كركوك من الاستفتاء وربط مستقبلها بالتوافق العراقي، وتسريع تسليمها للحكومة المركزية في بغداد، وصار التوافق العراقي الإيراني التركي السوري أن يجد نقطة لقاء مع هذه القيادة الكردية عنوانها، إلغاء نتائج الاستفتاء في كركوك، وإعادة كركوك إلى حضن الدولة العراقية كمدخل لحوار هادئ ينهي القضايا العالقة ومن ضمنها يبحث مصير الاستفتاء. – حمل الجنرال قاسم سليماني الصورة كاملة لقيادة البرزاني، داعياً لتلقف الفرصة قبل الدخول في مرحلة يصعب معها العودة إلى الوراء، فكان الردّ باستجلاب عناصر حزب العمال الكردستاني إلى كركوك، عشية انتهاء المهلة ليل الأحد الإثنين. 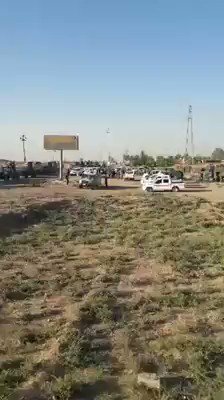 وبدأت العملية التي استعد لها الجيش العراقي ووحدات الحشد الشعبي. واتخذت فصائل البشمركة في كركوك موقفاً إيجابياً، وهي في غالبها تتبع لحزب الطالباني، ومثلها العاصمة الكردية الثانية في السليمانية التي تسعى لتوافق مع دول الجوار ومع الحكومة المركزية في بغداد، بخلاف أربيل وزعيمها البرزاني، ما جنّب العراق والمنطقة حرباً أهلية تجتمع فيها حكومات العرب وإيران وتركيا بوجه الأكراد، لتنقذ الحكمة الطالبانية المنطقة من الخطة «الإسرائيلية» الهادفة لحروب تقوم على اصطفافات عرقية صافية. كما حدث عندما أحبطت حلب ودمشق حلم الحرب المذهبية في سورية. – ما جرى في كركوك سيشكل نقطة تحوّل في مصير المنطقة. فهو من جهة يقول للأكراد في سورية والعراق أن الأميركيين والسعوديين و»الإسرائيليين» الذين يشجّعونهم على التصعيد نحو الانفصال لن يقدموا لهم شيئاً ساعة الصفر. ويقول للعرب والإيرانيين والأتراك، إن المواجهة سياسية وليست عرقية ولا قومية، وإن القيادة الحكيمة للسليمانية شريك في إعادة صياغة العلاقة بين مكوّنات شعوب المنطقة بطريقة تقوم على الاحترام المبتادل للخصوصيات، والعيش السلمي الواحد، وإحباط مشاريع الفتن والحروب الأهلية. – البرزاني ينتحر بعدما لعب ورقة حظه الأخيرة، بكامل الرصيد الكردي والإقليمي والدولي، وفقاً لمعادلة «يا قاتل يا مقتول»، وها هو يخرج مقتولاً، من دون أن ينجح بدفع المنطقة للاقتتال. فالمعادلة المطروحة اليوم أمام الأكراد كردية كردية وليست بين الاستقلال والتبعية، فقد منحوا مشروع البرزاني تفويضاً مفتوحاً للسير بدولة الانفصال وفشل بتوفير المقوّمات وتجمّد عند الخطوة الأولى وثبت خطأ حساباته وتحالفاته، ليكون الخيار المقابل الداعي للتعقل والذي يمثله تيار الطالباني بين الأكراد خشبة الخلاص الكردية بعقلانية وروح المسؤولية التي أبداها تجاه مستقبل ناسه وعلاقات الأكراد بجيرانهم، الذين عاشوا معهم آلاف السنين التي مضت وسيعيشون معهم آلاف السنين التي ستأتي. It looks Iraq is now heading to a military escalation between the Fedral Government and the Kurdistan Regional Government (KRG). Iraqi forces have launched a military operation to retake Kirkuk province from Peshmerga, a military force of the KRG, according to AFP. “Iraqi armed force are advancing to retake their military positions that were taken over during the events of June 2014,” the general reportedly told AFP by telephone, asking not to be identified. The report followed deployment of additional Peshmerga force to the disputed oil-rich areas and Kirkuk city. On October 11, the Kurdistan Region Security Council said that Iraqi forces were preparing to launch an attack on areas controlled by the KRG north of Mosul and south of Kirkuk. 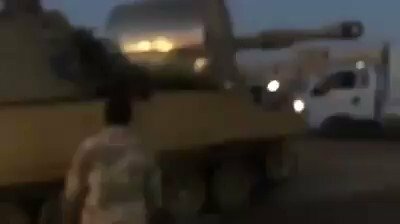 Arrival of Iraqi armoured troops to the village #Bashir south of #Kirkuk. On October 13, the Peshmerga General Command said that the Iraqi Army and the Popular Mobilization Units (PMU) have been preparing to attack areas outside the oil-rich city of Kirkuk since Thursday night with “foreign backing,” according to the KRG-run media outlet Rudaw. Peshmerga Forces must be in highest state of readiness to defend people and land of Kurdistan and retaliate against all threats/attacks. Last night Popular Mobilization Forces and number of Iraqi Forces were deployed to attack Peshmerga-held areas, particularly around Kirkuk. On October 12, Peshmerga forces reopened the Mosul-Duhok and Mosul- Erbil highways after closing them for hours on October 11, according to Kurdish sources. Peshmerga claimed that the highways were closed to prevent an attack of Iraqi government forces on the Kurdistan Region. “There are two roads connecting the Kurdistan Region to Mosul, one from Erbil and the other from Duhok. Both have been closed. We are waiting orders from our superiors to open them again,” Arif Taefoor, commander of the Peshmerga told the Iraqi-Kurdish Rudaw news network. Iraqi sources reported that the Peshmerga deployed more units in Kirkuk city, and north of Mosul city. From its side, the Iraqi security forces and the PMU also deployed more units north of Mosul city, and south of Kirkuk city, according to the sources. The tensions between the Federal Government and the KRG will likely have a bad impact on the upcoming military operation against ISIS strongholds of al-Qa’im and Rawa in western Iraq. Such negative effect was highly expected by many sides, and this questions the real motives behind the KRG decision to hold the Kurdistan Region independence referendum before clearing Iraq from ISIS. More accurate, only months before the last crucial battle against ISIS in Iraq. However, Iraqi military source told the UAE-based Arab Sky News TV channel that the government forces “are ready to launch the battle of liberation of al-Qa’im and are not interested in any other battle”. The stament confirms that the Iraqi Federal Government is committed mainly to fight ISIS, although of the Kurdish pressure. The breaking of the three-year-long Daesh [Arabic acronym for “ISIS” / “ISIL”] siege over the eastern Syrian city of Deir ez-Zor has been followed by a series of strange developments along the frontline. The first of these was the appearance of American Humvees and Cougars in areas occupied by Daesh militants. Last week, the Russian Ministry of Defense released a collection of aerial images showing equipment used by US special forces operating freely among Daesh formations. The images also showed American troops enabling the smooth advance of the US-backed Syrian Democratic Forces (SDF) through Daesh-held territory. “Facing no resistance from Daesh militants, the SDF units are advancing along the left shore of the Euphrates towards Deir ez-Zor,” the ministry said in a statement. According to Moscow’s interpretation, US military personnel “feel absolutely safe” in the area controlled by terrorists, demonstrated by the fact that they chose not to deploy a “screening patrol”. Shortly after the images were released, the battlefield witnessed another odd occurrence, involving the death of a Russian Lieutenant-General. Valery Asapov, who was assisting in the liberation of Deir ez-Zor, was killed during Daesh shelling on a Syrian army command outpost. Highlighting the peculiar nature of the attack is the sheer precision of a single projectile – most likely guided from the air – that killed the Russian. Russian media reported that an investigation into the incident revealed that Asapov’s death was the result of “leaked information on his location to the side that carried out the attack”. Earlier, Russia’s Deputy Foreign Minister Sergei Ryabkov made it clear where he believes the blame lies. He described the demise of the senior officer as his country’s “payment in blood for the duplicity of US policy in Syria”. Both the images showing American troops teaming up with terrorists and Asapov’s death are further proof of Washington’s reliance on Daesh for securing an unopposed advance for its Kurdish proxies in Syria, as well as occupying the strategic and oil-rich territory in Deir ez-Zor. Forced to abandon their objective of toppling the Damascus government, the Americans and their allies have long since been focused on capturing eastern chunks of Syria and its oil-laden regions. It is now an open secret that oil resources in both Syria’s Deir ez-Zor and Iraq’s disputed Kirkuk region have been earmarked as an essential revenue stream for emerging Kurdish statelets. American control over the area was meant to aid in the rise of a Greater Kurdistan, which would not only separate Damascus from its allies in Iran and Iraq, but would also serve as the new regional buffer against the Resistance Axis. Although the Syrian army’s push eastward and the breaking of the Deir ez-Zor siege created unforeseen obstacles for Washington’s agenda, the Americans have refused to admit defeat. Instead, the world is being treated to an American military that is a lot less shy about its collaboration with terrorists and a lot more openly hostile towards Damascus and its allies. As such, the fact that Washington has abandoned the ‘Assad must go’ mantra, should not be expected to translate into a less hostile US military effort in Syria. On the contrary, Syria, Hezbollah, Iran and Russia should expect more attacks similar to the one that killed Valery Asapov as the race for Deir ez-Zor heats up. Earlier this month, the mainly-Kurdish SDF reportedly occupied the Tabiyeh and al-Isba oil fields in the northwestern countryside of Deir ez-Zor. There is little doubt that the SDF were accompanied by US Special Forces, who likely provided the same sort of logistical and tactical support captured in the images released by Russia’s Ministry of Defense. 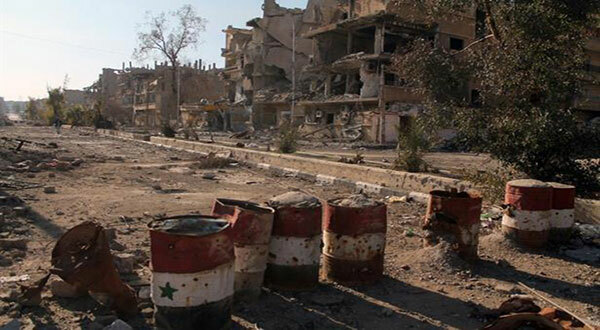 However, neither Damascus nor its allies can be expected to hand over Syria’s oil fields without a fight. The developments on the ground have led some experts to conclude that the current phase of the six-year-long war may be its most dangerous. The fear is that the battle for Syria’s crucial resources and strategically located territory could spark a direct confrontation between the world’s rival superpowers. And although some steps have been taken to avoid such a scenario, the only way to guarantee that a clash is averted is if one side backs down. Thus far, there is little sign of compromise. هزمت بريطانيا وفرنسا السلطنة العثمانية في الحرب العام 1918. أعلن مصطفى كمال اتاتورك وفاتها بإقامة الجمهورية في تركيا العام 1924. اختلف الورثة من تركٍ وعرب وكرد على حصر إرثها وتقاسم تركتها وما زالوا. المفارقة أنّ «قاتلَيّ» السلطنة تولّيا، من خلال مؤتمرات ومعاهدات نظّماها، تحديد هويات الورثة وعددهم وحصصهم الارثية. أقرّا للترك دولةً في برّ الاناضول. اصطنعا للعرب بضع دويلات في بلاد الشام وبلاد الرافدين. وعدا الكرد بدولة في مفاوضات معاهدة سافر Severes 1920 ثم أنكراها عليهم لاحقاً. منذ ذلك التاريخ تدير دول أوروبا، ومعها أميركا، نزاعاً متمادياً بين ورثة شرعيين وآخرين مفترضين للإرث العثماني التليد. الكرد كانوا وما زالوا ساخطين على ما انتهت إليه قسمة التركة العثمانية: غالبيتهم أُبقيت في تركيا الكمالية. أقليتهم جُعلت من نصيب العراق وسورية. أما مَن كان منهم يعيش خارج السلطنة العثمانية فقد أُلحِق بالكيانات السياسية القائمة وأهمّها إيران. زالت تتلاعب بمصائر هذه الأقوام بقدر ما تتيحه موازين القوى الدولية. في هذا المجال، نشأت مفارقات لافتة. فالترك الذين أسقطت أوروبا امبراطوريتهم وتصرفت بـ «ممتلكاتها» انحازوا إلى دولها في الصراعات الدولية التي أعقبت الحرب العالمية الثانية 1945-1939. والعرب الذين كانت بريطانيا وعدت الشريف حسين الهاشمي بدولة تضمّ الولايات العربية المطلوب سلخها عن السلطنة العثمانية أُحبِطوا فارتضى بعض قادتهم نصيبه من التركة التي جرى تقاسمها، واعترض بعضهم الآخر. أما جمهورهم الأوسع فكان وما زال يتوق الى إقامة دولة واحدة تضمّ الشتات. يرى بعض المراقبين أنّ البرزاني يناور ولا يصادم، وأنه يحاول استغلال حال الاضطراب والفوضى التي يعيشها العراق وحال الشجار والاختلاف التي تمرّ بها الدول الإقليمية والدول الكبرى كي يعزّز مركزه التفاوضي إزاء حكومة بغداد بغية حملها على تقديم تنازلات في مسألتين رئيسيتين: إقرار «حق» الأكراد في محافظة كركوك وفي المناطق المتنازع عليها في محافظات نينوى وصلاح الدين وديالى التي تضع البيشمركة يدها عليها، وتكبير حصة إقليم كردستان في ميزانية الدولة الاتحادية وفي عائدات النفط المستخرَج من منابعه في الإقليم المذكور. فوق ذلك، يبتغي البرزاني تنازلاً آخر: موافقة جميع الأطراف، العراقية والإقليمية والدولية، على تأجيل الاستفتاء وليس على إلغائه. ذلك أنّ تأجيل الاستفتاء ينطوي على معنى الإقرار بحق تقرير المصير، رغم الانصياع إلى مطلب إرجاء تنفيذه، بينما يعني إلغاء الاستفتاء إنكار حق تقرير المصير برمّته. المعضلة التاريخية هي حاجة جميع أقوام السلطنة العثمانية المهزومة إلى تقرير المصير من جهة، ومن جهة أخرى ضرورة ألاّ يمارس كلٌّ من هذه الأطراف حقه في وجه الآخرين وعلى حسابهم. فالعرب والكرد والترك وغيرهم من الأقوام لهم الحق بتقرير المصير الذي مارسته عنهم عنوةً بريطانيا وفرنسا غداةَ انهيار السلطنة العثمانية باصطناع كياناتٍ سياسية هشّة وقيامهما بتوزيعهم عليها اعتباطاً بينها أو في داخلها. الجواب: برسم مسار طويل يبدأ بتعايش الأقوام داخل كلّ كيانٍ من كيانات بلاد العرب والترك واتحادها في طلب الحرية والديمقراطية وفي بناء دولة مدنية على أسس حكم القانون والعدالة والتنمية. والمأمول أنّ بلوغ هذه الأقوام حال الدولة المدنية الديمقراطية يضعها أمام خيارين: 1 البقاء فيها بإطار نظام مركزي ديمقراطي أو اتحادي فدرالي ديمقراطي، أو 2 الحوار والتفاوض مع الأطراف المعنيين لتحقيق الاستقلال بمودة وإحسان. كِلا الخيارين أقلّ كلفةً من النزاع والاحتراب.